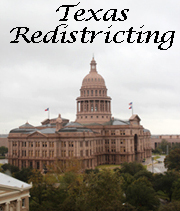 There have been two significant communications from different courts that gives us some indication as to the direction and the schedules that the San Antonio three-judge panel will take us in the ongoing Texas redistricting saga. This update will inform you as to their contents and significance to the proceedings. On Tuesday afternoon, the Washington, D.C. three-judge panel issued a statement notifying concerned parties not to expect a decision in that case for at least 30 days. It was hoped that the D.C. panel might issue a quick decision so as to allow the San Antonio three-judge panel to utilize the D.C. panel's findings as part of the San Antonio panel's process of issuing new interim maps that are legally compliant. A delay of a month by the D.C. panel puts the San Antonio panel in the position of either: waiting at least an additional month before further action, or instead, moving ahead with the drawing of interim maps based on the information they already have available. Thursday, the San Antonio three-judge panel issued an order requiring interested parties to the redistricting lawsuit to file briefs by February 10th, and setting an additional status conference for 8:00am on February 15th. The San Antonio panel also had previously scheduled a trial on the State Senate map for February 8th. These actions suggest that the San Antonio three-judge panel is willing to move the map-drawing process forward without necessarily waiting on the Washington, D.C. panel. However, the schedule put forth by the court today does not lend itself to an April 3rd unified primary date. While it is still theoretically possible to have an April 17th primary date (if the court issues a very quick decision after the February 15th hearing and immediately drew new maps), in all likelihood, this new schedule means that a new single unified primary date could not be held until at least April 24th. Meanwhile, on Tuesday, the Texas Democratic Party filed an advisory to the court withdrawing their previous statement that a single unified April primary was possible. TDP now takes the position that it does not oppose a bifurcated primary with the first primary in April as a subsequent primary to a later date, but only if the State of Texas will agree to pay for it. The Texas Democratic Party's position is that if the State of Texas will not pay for it, that they do not favor a bifurcated primary, but rather, a much later single unified primary, presumably sometime this summer. It remains the Republican Party of Texas' position that in order to comply with the process specified by the Texas Election Code for the selection of delegates to the State Convention, that a primary must be held on or before April 17th. Consequently, the State Chairman, in consultation with party leadership, is examining all options in order to resolve this conflict and will issue further advisories once a recommended course of action is determined. On a related topic, the Republican Party of Texas has been informed that communication is still occurring between the Attorney General's office and the plaintiffs to the redistricting suits. Therefore, the theoretical possibility still exists that an agreement between the Attorney General and the plaintiffs could be obtained before Monday, February 6th - thereby allowing an April 3rd unified primary. However, the odds of this happening diminish by the hour. It will be apparent by Monday whether an agreement was reached in time to have an April 3rd unified primary. If there is no agreement, the case will move forward and we will continue to pass along information just as soon as we obtain it. In the meanwhile, we would like to ask for your help. These repeated delays and court appearances are quite costly to the State Party, and we have been amassing large legal bills to defend and fight for Republican interests in this ongoing trial. The RPT Defense Fund has been thoroughly exhausted of funding, and we are now having to use funds from our main party account to continue paying our legal bills in relation to this trial.